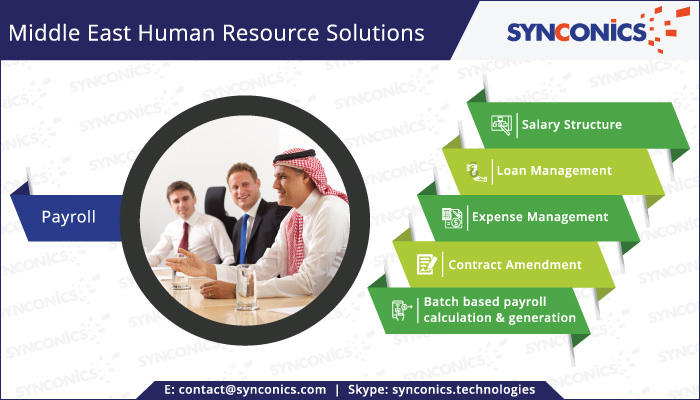 Middle East Human Resource Solutions | | Synconics Technologies Pvt. 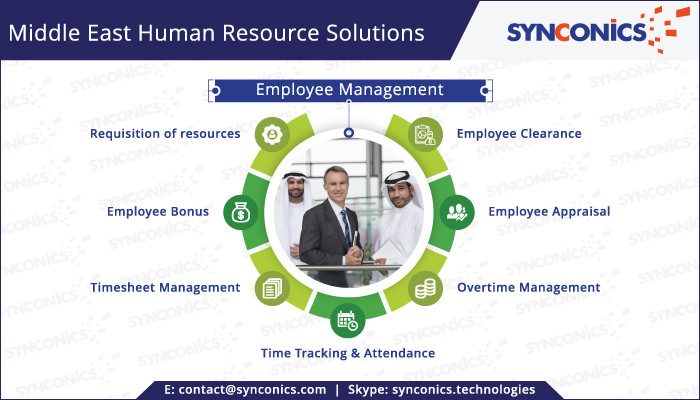 Ltd.
Synconics Technologies has developed Middle East HR Solution in Odoo to satisfy nearly all your complex needs of HR requirements from Hiring an employee till retirement process of the employee. 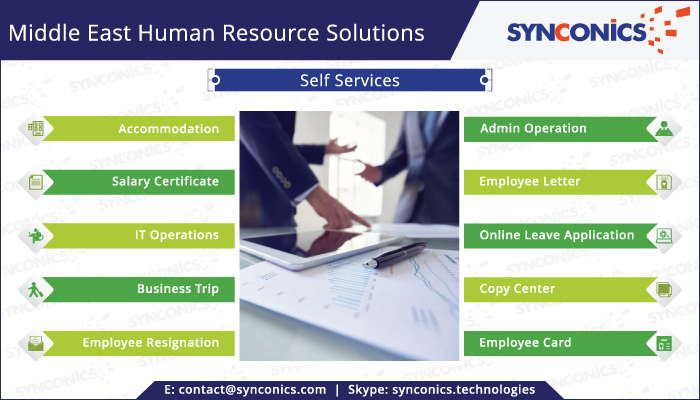 This HR solution is very simple and easily adoptable by your employees. This includes Employee Management, Time sheet, attendance, payroll, Talent Management, Recruitment, Planning & Analytics. 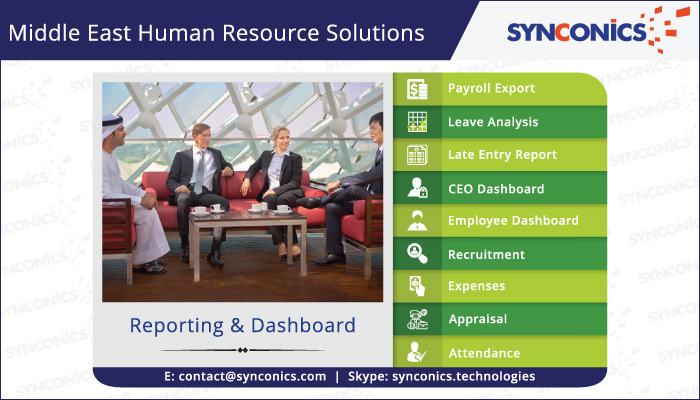 This HR software will be accessed from every device – desktop, laptops, Mobiles and Tablets. This will reduces the paper based approvals and increases the efficiency of the organisation. It reduces the paper based approvals. It will increase the effectiveness of your staff. It will increase the productivity of your organisation. This HR Solution is Bi-lingual i.e. Arabic & English. Saudi GOSI, IQAMA process & EOS calculation. In Middle East countries mainly people are using Arabic Language and pointing to the same the Middle East Human Resource module is setup bilingual i.e. Arabic and English language can be changed using preference of every individual login. Due to Localization is forcefully implemented in many countries to provide job to locals; Synconics too compelled to develop the system with the same fashion so that the system will get input in any of these language and the result remain same in the system database. An institution or an organization is continuously growing and as per growth to control the job, workforce also to be grown. The planned workforce expansion will give better result as the resource will reinforce the point where it really required. Where there is long hierarchy, an individual will unable to furnish the requirement of workforce of each and every department. Hence, it is advisable to get requirement from in charge of the department or unit. It is obvious that the higher authority will study and cut short vacancies considering the overhead budget availability and/or other management factors but even after the same there is less chance of hampering the work. Workday Time Tracking simplifies workforce management by configuring workflows, processes, and work rules in a single, consumer-driven, application. It also allows you to control labour costs and compliance risks through integration with Workday HCM and Payroll. This will make easy to count work hours given to the organization and also keep accountability of staff that has done overtime. The staff too can check the history of attendance in the system using own User Portal. Human Resource Department is also responsible for the job which is compulsorily handled physically. Where, there is any business trip then need to coordinate with staff and HR executive for relevant documents and paper work at the same time visit accommodation periodically for maintenance and so on. In many organizations, for each responsibility different individuals are there mean a team to handle Administrative Operation. Every Organization has own structure and business workflow, so as to salary structure too. During an appointment, we just need to assign the structure to the employee will start the benefits of company by default. At the same time, while generating the salary it will be easy to segregate the salary in total by department, section and position. It also helps in the automation of Payroll process. Observing payroll line by line in monitor may tedious so will be easy to export it in the wide spread sheet and print either. This will be bit effortless for being reconciliation with other relevant document i.e. voucher, loan deduction and skip salary. 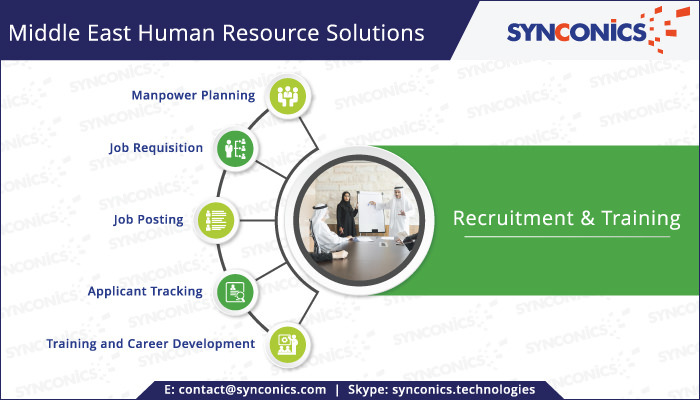 For more information about Middle East Human Resource Solutions please email us: contact@synconics.com or Skype: synconics.technologies or call us on: +91 942-686-4274 or visit our website: synconics.comto know more and how best we could associate.